Many times over my years of teaching painting, I’ve said to people, “Don’t fuss about trying to improve a dodgy painting, do a new one and do it better.” But......that is not always the best advice – sometimes a painting only needs a little tuning to turn it from a failure to a winner! So.... my latest DVD “Enjoying painting 4” is about just that – learning how to critique your own work and then knowing what to do to improve a disappointing painting. I know I have been through the frustration of a failed painting many times over the years so I know what I’m talking about! But I have also enjoyed the sweet taste of success when I have re-thought and rectified the problem. It’s now available on the DVD page on my website and can be purchased as a disc or a download. I trust you will enjoy it and it will be a real help in your painting. I’ve just realised – we’re about to enter 2018. I’m looking forward to it and I’m hoping it will be a year of great progress and fulfilment for all of us. Just briefly, I should mention one of the highlights of this year for me. 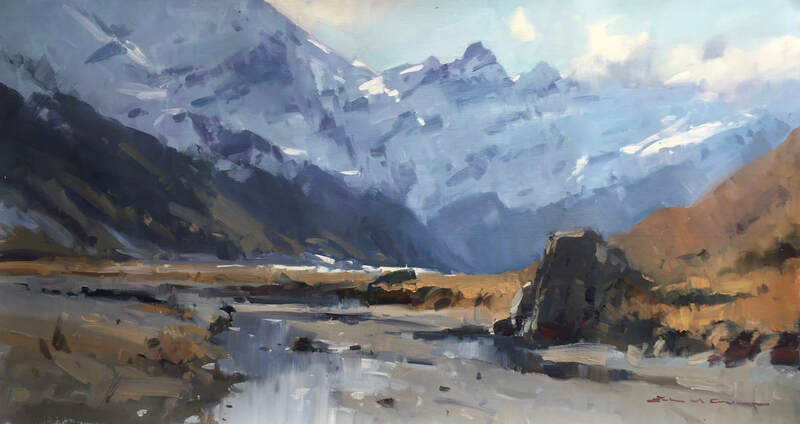 In November, ten painters gathered in Glenorchy. They came from England, California, Australia, and New Zealand. We had a fantastic two weeks together enjoying painting the beautiful landscape around us. I felt honoured to be among such a group and I certainly hope it can happen again – perhaps even on a yearly basis. Thanks guys! This was one of those rare times. A scene I have looked at many times in the past, but this was different. ​I had always seen Turret Head as a huge, cold, grey, lump of rock ...but in this evening light it was glowing with colour. It even had beautiful purple/blue shadows to complement the orange/ochre highlights! A real “wow” moment! I very rarely use photographs to paint from as I think they can stifle your style… and I so much prefer to work outside anyway. However, seeing something like this was just too good to miss so my wife's camera was called into action. I was eager to get to my studio easel while the excitement of that view lasted. I'm not absolutely sure that I have finished with the painting yet but that doesn't matter too much – I like it as it is anyway. I believe that is the real essence of painting. It doesn't matter whether you're working on a landscape, a still life, or some flowers, you need to be excited! 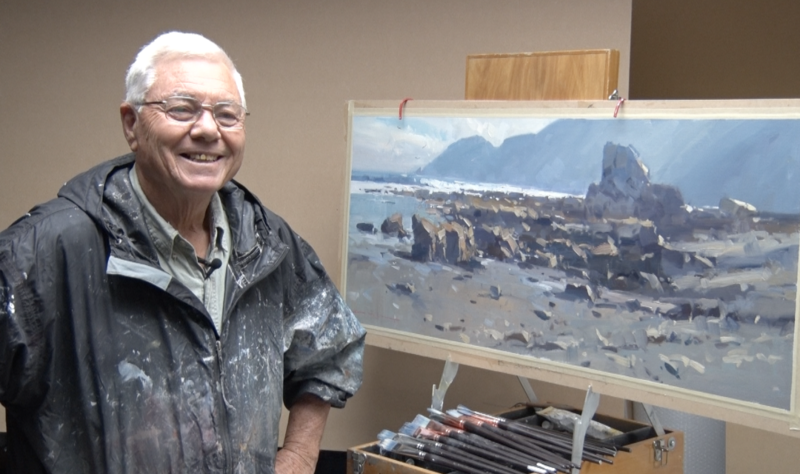 I'm also excited to tell you that I have finally finished my next DVD - “Enjoying painting 2”. Perhaps relieved would be more accurate! Due to a number of problems, it has taken what feels like forever to complete this one. However, If you go to my DVD page, you'll see it there ready for downloading or for buying a disc. It's aimed at anyone who thinks they can learn more about painting. I certainly hope that I have learned heaps from making it! We were told That computers were going to make life much easier for the world, but I've found them to be work demanding and frustration building! However, I'm getting over it (I hope) as I learn more. ​The trouble is that many of us who use computers today were brought up in a non - computer age and our brains don't seem to work quite adequately when it comes to computer thinking. I'm very fortunate – I have a 15 year old grandson, Samuel, who is usually able to straighten me out. You may be wondering why I am talking about this? Well, over the last week or two (attempting to speed up my computer and make Final Cut Pro X, a film editing program work properly), a friend and I decided to rebuild my computer and in the process I lost my emails, addresses, etc. Many people have been receiving my blogs and have written to me asking questions about DVDs, painting classes, materials, etc, so this is really just an attempt to tell you that if you have written, and have not received a reply, I do apologise and ask if you would just write again please but on a different email address: johncrumpartist@me.com Thanks! ​I've found this to have been a very busy year. With filming and editing, taking classes (even in Australia this year!) and of course my own painting and framing, time seems to have flown. Despite all that, I've been aiming at doing a blog every month but, as in the past, I've only managed three this year, and that's counting this one!! However, the New Year is coming. I'm certainly not going to be making New Year resolutions – but I will aim to do better. In the meantime my best wishes for a good holiday period over Christmas and the New Year and hopefully, a prosperous and fulfilling painting time next year. Oh no - another reminder!! I've said it before and I guess at some stage, I'll say it again. "Sorry, it's been so long!" You'll know what I'm talking about of course – the huge gaps between my blogs. I'm fortunate that you people out there seem to be very forgiving and eventually, somebody will give me a gentle nudge. The trouble is, apart from being distracted with other things, I don't feel that I've had a great deal to say just lately. I've not even been doing enough painting and we all know how easy it is to slip backwards, to lose our reckless abandon with the brushes, to stop seeing subjects as easily as we would like, if we are not painting enough. However, I can say that I've not been entirely slacking! I've been working quite hard on a new series of DVDs. For a long time, I have been wanting to do a series, perhaps as many as 10 or more discs that cover different aspects of painting. Starting with the very basics – what tools/materials I've chosen to use after 48 years of experience, then moving on to the many questions that people so often ask – what colours do you use, how do you see something that will make a good painting, where should one start in a painting, how do you beat the changing light etc. 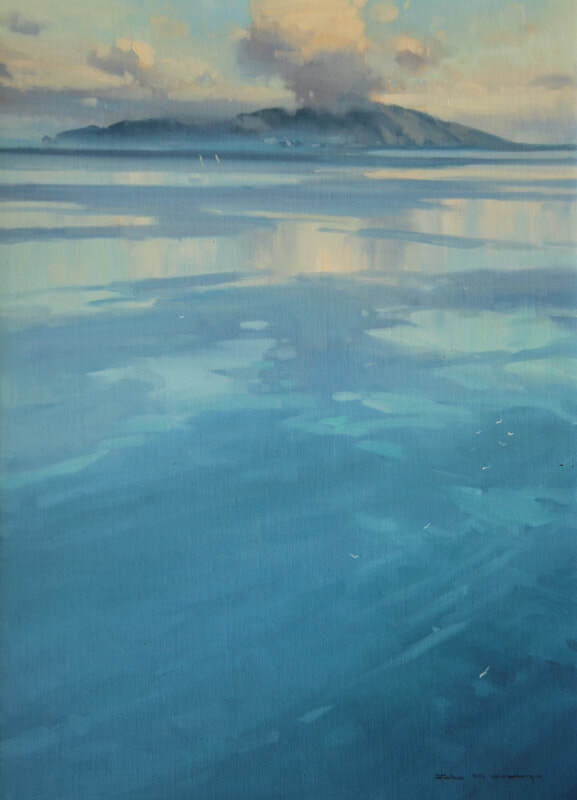 From that point, I will move on to different subjects, mainly plein air but also some work in the studio, that hopefully will cover painting mountains, coastal, buildings, even studies of things like birds and flowers and so on. So... with a new much better quality movie camera and a more advanced editing program in my computer, I'm hoping I can get better at climbing the steep learning curve that I've taken on! I'll let you know when the first one is available on my DVD page. Meantime.... onward and upward!